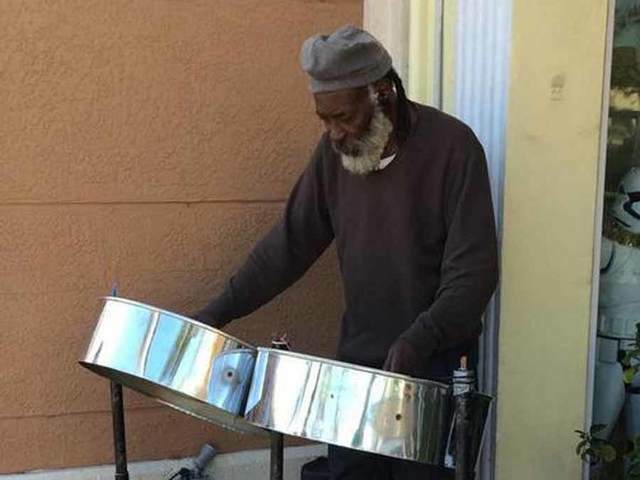 LAKE WORTH, Fla. - A beloved, elderly musician is robbed while playing music in downtown Lake Worth and now, the community is rallying together to help him. Supa Peter is 77-years-old and has been playing the steel drums in downtown for years. "He just brings joy to pretty much everybody that he meets with his music," he said Jayme Selman, a friend who has known Supa over the years. "When I met him, he would play shows, he would walk from West Palm all the way back here, he carries the steel drum cases. His perseverance and commitment -- he works so hard. Everything he has he certainly deserves, and more." On Monday night, someone stole his tip jar as he performed outside the Kava Sutra Bar on Lake Avenue and ran off. Police were called, but the thief got away. The incident was caught on surveillance. Friends say Peter lives in poverty and relies on his music to support himself. Selman runs the local chapter Can I Help You Lake Worth, which performs charitable causes throughout the community. He and others took that spirit and put it toward helping Peter. Now, the downtown business community is raising money for Peter and a fundraiser on GoFundMe has also been launched to help him.